Welcome to the vicuna fiber directory section of the Apparel Search website. 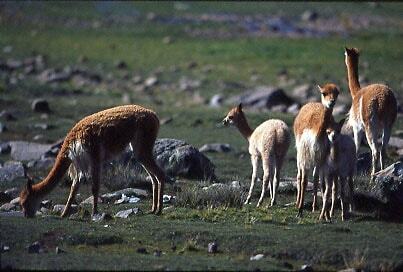 In this section, you will find educational information and links to resources relevant to vicuna fibers. If you work in the apparel industry or simply have an interest in vicuna textiles, this is the area for you. If you do not find enough information in this section of our vicuna fibers guide, you may wish to check the textile section or go back to the fiber directory main page for additional textile fiber choices. If you work for a company that supplies vicuna textile products, you can use the add your company link at the bottom of this page to create a listing on the Apparel Search vicuna directory pages. If you wish to read more about vicuna, don't forget to visit the textile news section. More specifically, view the textile fiber news area. Also, if you work in the fashion industry or textile industry, please join us at the fashion industry network for discussions about the use of vicuna. Alpaca Nation: AlpacaNation.com is an Internet Web site uniquely devoted to the alpaca industry. AN is specifically designed to bring the industry's global community of alpaca breeders, owners, and suppliers into a centralized marketplace on the Internet. Its presence on the World Wide Web allows alpaca owners to freely access the most complete and current market information at any time and from any location in the world. Bonny Doon Alpacas: their alpaca ranch is nestled in the California coastal mountains and is open to visitors by appointment. Whether you're an experienced alpaca breeder or new to these unique and beautiful animals you will enjoy working with Eric Hoffman, owner of Bonny Doon Alpacas. His enthusiasm and love for alpacas has influenced the development of the alpaca business in North America for the last fifteen years. Learn more about women's vicuna coats. Learn about men's vicuna coats.